Here at FP International, we take an active interest in sustainability and protecting the environment. While we do what we can to minimize waste with eco-friendly void fill materials, landfills are only one contributor to a major issue: global warming. Where we trap air in layers of biodegradable* plastic, a power plant in Iceland is upping the ante trapping greenhouse gases into rock. But before we elaborate on that sorcery, let’s first take a look at the problem. CO2 emissions associated with retail and ecommerce product pathway stages. Image source: Anna Argyridou (via Stanford University)[/caption]While industry and transportation (that is, all types, including commercial, personal, and industrial) account for 35 percent of 2010’s global emissions, that isn’t to say some aren’t doing their part. Digital retailing, for example, has helped cut down CO2 emissions tremendously, removing a large chunk of the problem: customer transport. For businesses grounded in the physical world, reinventing packaging and rethinking sustainability are also strong steps in the right direction. Preventative measures are one thing, but what about the gases already released into the air? 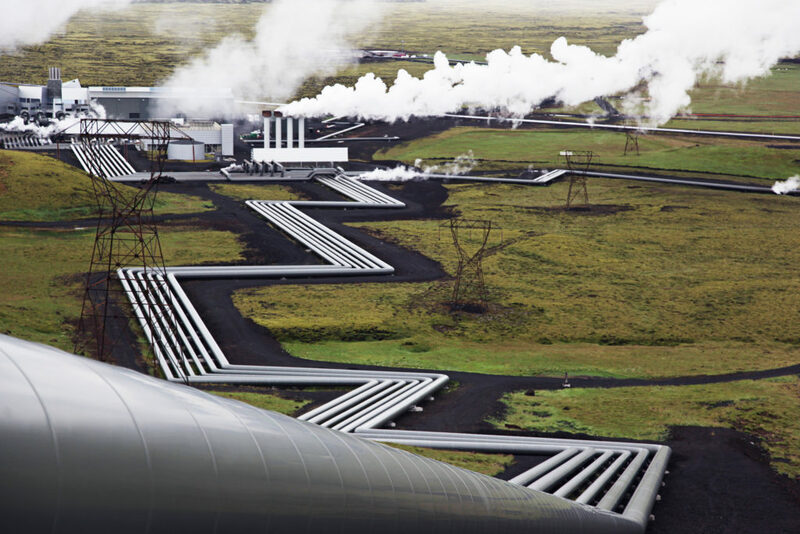 The Hellisheidi Geothermal Power Station in Iceland has been trying to answer that very question. Their answer: CarbFix. The pilot program‘s primary goal is “to imitate the natural storage process of carbon dioxide already observed in basaltic rocks in Icelandic geothermal fields.” In layman’s terms, they want to pump greenhouse gases into porous volcanic rock and let it mineralize naturally (though with a bit of help). While the CarbFix process might take millions of years to occur naturally, with the help of technology, it’s sped up to within two years. The injected carbon dioxide and hydrogen sulfide mixes with water and reacts with the calcium (CaO) and magnesium (MgO) oxide present in basalt. The reaction then allows the engineers to form limestone (or calcium carbonate, CaCO3) for permanent (and more importantly, leak-free) storage. As the main component to this process is basalt or other similar volcanic rocks, the team hopes that other research and engineering groups around the world can adapt CarbFix in their countries, given the rocks’ abundance. While this is an exciting new technology, however, there is still a lot of work to be done. As fantastic as CarbFix works on a geothermal power plant, the real test will come when the technology starts moving over to coal power plants. Since geothermal power plants only have a fraction of emissions their coal-fed counterparts, the question becomes less about where to put the carbon dioxide and more about how are the machines that govern and catalyze these processes going to be, in turn, powered on a large scale. Either way, we still have a long way to go in making a meaningful impact in reducing greenhouse emissions and cleaning up the planet. As far as CarbFix goes, excess carbon dioxide might be a problem we end up burying and forgetting like we try to do with everything else. Until then, we all have our parts to play to lower of carbon footprint, even if it’s not steeped in alchemy and science fiction.